After years of being under siege, Mafikeng has become a lively city that boasts amazing history, culture and wildlife. The city of Mafikeng is a highlight destination on the Rovos Hunting Safari tour. Here, hunters and non-hunters have the opportunity to explore and experience the city’s wildlife and history. Before arriving at Mafikeng, the hunters are gathered for a presentation on field etiquette. The presentation is conducted by Rovos Hunting Safari’s professional hunters who form part of hunting organisations, which include PHASA and The African Professional Hunters Association. Firearm safety: hunters are not allowed to move with a loaded gun. Considering that the ground is rough, a trip and fall with a loaded gun could be fatal. Also, this rule applies to climbing over fences and gates. Group etiquette: always carry your shotgun with the barrels open, which will serve as an indication that your gun is safe to other hunters. Ensure that you’re mindful of departure time, as faff time is particularly inconsiderate when hunting with a group. Communication with PH/outfitter: while it is expected that you’re polite, honest and straightforward, ensure that you simplify your choice of gun, as it can get confusing chopping and changing. What’s more, make certain to notify your outfitter/ PH if you require taxidermy as well as clear instructions about requirements prior to hunting. Tipping the team: consider tipping members of the staff as the cream on top, as it encourages them to make an additional effort when it comes to assisting on your shoot. Once all shooting guests have been briefed on hunting etiquette, professional hunters go through safety guidelines for the journey ahead. People are split into three categories. Full-day gamebird hunters will spend the day in the Mareestane area with lunch in the field. The plain game hunters will have a full day of hunting in the Mareestane area as well with lunch at the lodge. For those that will not be hunting, the itinerary will include a game drive in the Mafikeng Reserve and will have lunch with the guns in the field. Notable places to visit in Mafikeng include the museum in the town hall, which details the story of the great siege and the fort situated on Cannon Koppie. While Mafikeng is no longer as politically relevant as it was, a reminder of its past importance can be found outside the station; here the fine statue of Rhodes faces the north with the map of Africa in his hands. This historical town is one of the stops along the luxury Rovos Hunting Safari Charter. In the North West Province near Mafikeng, a wonderful cave spot, Wondergat can be found. Depending on the season, advanced and technical divers can reach depths of up to 70 meters. 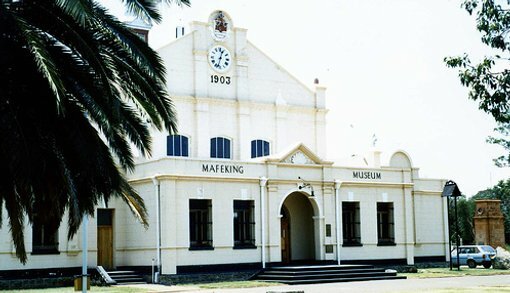 If you have a few hours on your hands be sure to wander the Mafikeng Museum and explore some of South Africa’s great history. Here you’ll have the opportunity to learn about colonial, political and the heritage of the Mafikeng. Situated in the city of Mafikeng, the game reserve encompasses 46 square kilometres of Kalahri and Acacia bushveld. The Mafikeng Game Reserve is home to popular wild animals such as wildebeest,springboks, and, to the protected rhino . Traverse the flat terrain on a game drive where nearly 2000 head of game can easily be viewed. The land was inhabited by Khoisan for thousands of years. They are known for their nomadic lifestyle and ability to survive harsh conditions, such as the dry and arid desert regions. All of the stone engravings and paintings found on the rocky hills and outcrops of Mafikeng are testament to the time that the Khoisan lived there. The Tswana then settled upon the land. Some of the tribes of Tswana, namely the baKwena and baGatla, developed the town further by erecting stone constructions and creating a town. The British formally founded the town in the 1880s. The British acquired land from the warring Barolong chiefs in return for war service. The town was thrust into the world political stage due to the great siege during the Anglo-Boer War of 1899. Colonel Baden-Powell led the defence of the town and quickly realised he had to formulate a plan if the town was to survive. He came up with the ingenious plan to use local boys as scouts. The scouts were used to take messages and assist in the running of the town. The town siege was broken after a whopping 217 days. Colonel Baden-Powell’s efforts made him famous, leading him to start the Scout Movement we know today. After the siege, Mafikeng was lauded and talked about for many months to come, with the shrewd Baden-Powell at its epicentre. During Apartheid, Mafikeng became part of Mmabatho- “mother of the people”- the capital and the homeland of Bophuthatswana. In 1994, Apartheid ended, Mmabatho was renamed Mafikeng and was rightfully absorbed into South Africa.